There are precious few ways to describe the Maldives that haven’t already been done. And while the scripts that talk of paradise write themselves, getting past the cliche can sometimes be hard to define. It’s not simply the image the islands conjure up, it’s what’s on offer that makes this such an alluring destination. There are, after all, more than 100 resort islands to choose from and many of those the nadir of the world’s finest hoteliers. We’ve covered some in these pages, too. 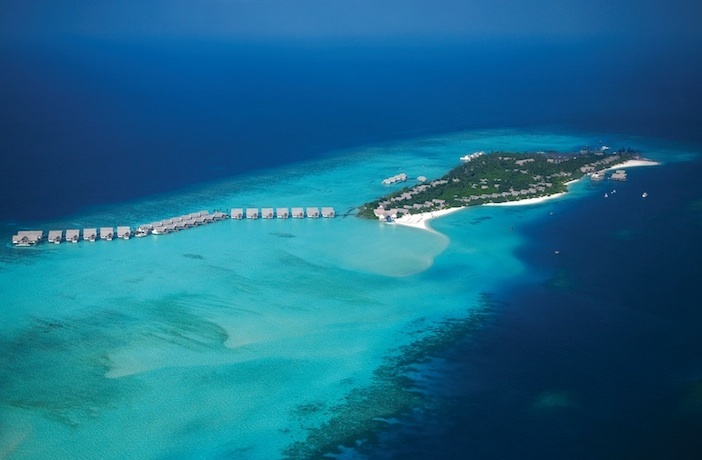 The policy of ‘one island, one resort’ keeps competition fierce and it’s this level of choice that makes this destination such a draw, with resorts raising their game beyond any conventional offering – if, indeed, a Maldives offering can be called ‘conventional’. Price is never an option for the Maldives; it can’t be. For those that can’t afford it, it’s the ‘once in a lifetime’ destination, a honeymoon destination. And for those that can, if you’ve been once, it’s easy to see why you’d go back again and again. So, for all that choice, it comes down to a personal preference. For me, that choice came down to one, quite simply. 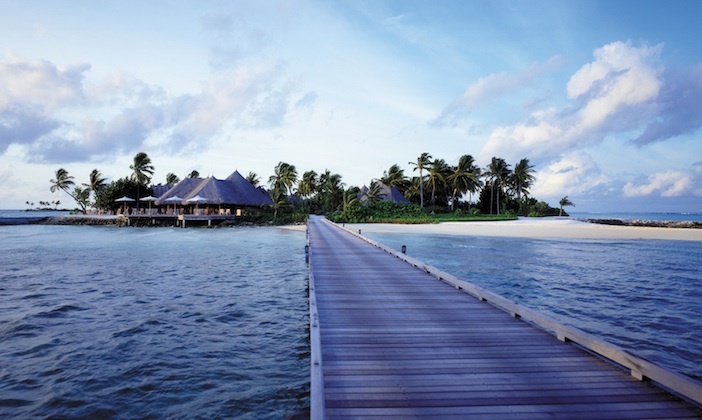 Well, technically, two; because Four Seasons are that rare Maldives creature, they have two islands on offer. Describing the Maldives really comes down to a more emotive experience, of which it’s hard to feel anything other than pleasure at every turn. With reality crashing back around me as I returned to Blighty’s shores, casting my mind back I consider what it was about the Four Seasons offering that defined my time in the Maldives and I can think of 15 instances where endorphins bounced through my synapses during my stay; 15 moments of joy, if you will. In truth, there were far more, but, barring the upgrade to Business Class (the only way to travel there), these were the ones that stood out. That I was entering another world was aided by the single flight, boarding from a temperate and business-like Heathrow airport the contrast that met me stepping out of that same door at Male felt as if the last ten hours had taken me through some sort of interstellar portal. The difference marked not so much by the change in ambience – it was 90 degrees, bright and balmy – more by the starkness of the topography. The Maldives, as a country, is 90% water. Stepping from the plane, through a simple, bygone-era terminal building, I was straight onto a cab rank like no other: a jetty for the boat transfer to the resort; twenty-five minutes skipping across rich blue seas, glimpses of what lay in store as we passed in surfing distance of a smattering of other islands in the Male atoll. 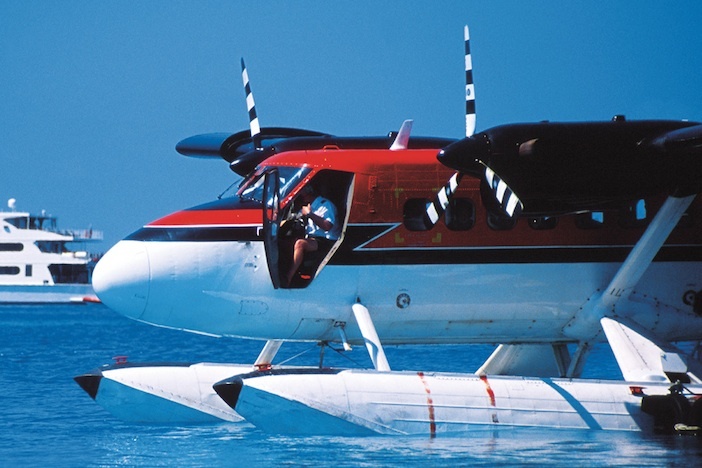 Better than any motorway transfer from airport to destination anywhere. If I thought that was a way to undergo international travel, the journey back was even better; a seaplane, like something from a Tintin comic, salt-faded and powered by a joystick and a pilot in flip-flops, took off from a pontoon off the island’s shore, giving the most spectacular angle on the archipelagos below, like cultures on a giant petri dish (if you’ll forgive the analogy), and landed directly at the terminal building at Male for our return boarding of the airbus, in air-conditioned and champagne-enriched business class. Just these, and the contrast of London city living with the simplicity of boat-hopping in the Indian ocean, makes for the first and last of these moments of joy. I stepped from the bungalow, through the mangrove hedge bordering the veranda and came face to face with a diver. He was waist-deep in the sea, which was mere feet from the edge of my villa. I joined him in the water, and was soon among coral frames, many blossoming with growth and the most dazzling array of fish around me. Drifting with the current, I was mesmerised. The current, I learned later, encircles the island, harmlessly sweeping you round to the sunset side. After some moments, peering from the water, I found I was almost among the stilts of the water villas at the far end of the island. As I set for the shore, I found I had company; an eagle ray drifted past me and peeled off into the ethereal blue. It set the moment. Swimming with fish, a balmy ocean breeze, soft sand between toes, such things are simple pleasures and often little more than one needs. Added to this is the Lomi Lomi. Not a bird of paradise, as its name might suggest – nor a Hawaiian massage of the same name – the Lomi Lomi is the most refreshing elixir and one which, when enquired about, is deceptively straight-forward in the making; crushed ice, lime juice and honey. Nothing more. And yet it would come to define almost every meal, every post-activity cool-down, an instinctive order at the bar. If there was a flavour of Kuda Huraa, it was the Lomi Lomi. Similarly, the food that defines island life here is equally exotic and often refreshingly simple. My first lunch, at Cafe Huraa, accompanied with a view through bent palm trees hushing in the breeze and the sight of crystal surf, was an obvious and automatic choice: reef fish tacos. While simple and an obvious choice, at the other end of the spectrum was the bewildering array of fine Indian food on offer at Baraabaru, the resort’s signature restaurant. 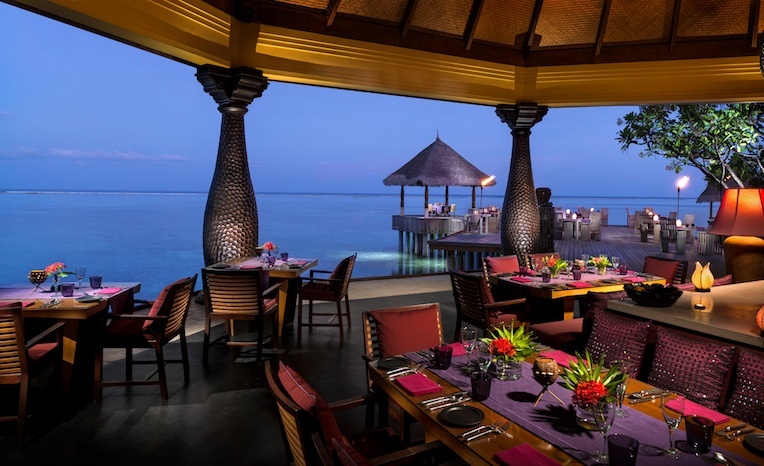 Maldivian for ‘excellent’, Baraabaru serves just that; authentic home-style regional dining from all over India from its Kerala-style pavilion and torch-lit sea deck. Deciding which of these made the list was too tough a choice. It’s a common misconception with the Maldives that the confines of an island for any length of time might leave one struggling with things to do. Even for an inveterate restless beach-phobe nothing could be further from the truth. I’d go so far as to say the opposite is the case, that you simply don’t have enough time to get bored. Part of the experience is that time seems to evaporate and it happens in two ways; it’s sped up with activity and dissipates with calm. How time is absorbed is represented by the fact that resort time is an hour ahead of Male. Not by geography, however, but by design; it’s set to make sunsets and sunrises more guest-friendly and, as part of this playful attitude, the sides of the island are described not as east and west but sunrise side and sunset side. Needless to say, with the views to be had, some of the resort’s better activities are planned at these times. Sunset fishing is not quite the battle with an arcing marlin I was hoping for. Rather than big game fishing (though that is on offer), we were a little more sedate than that, boarding a large, top heavy dhoni – a traditional Maldivian open-sided fishing boat – and venturing into the middle of the deep waters of the atoll to sink bottom lines for snappers and groupers and suchlike. We had no luck, alas, but as we bobbed about on the roof for the journey back, we were accompanied by pods of dolphins dancing through the waves. By contrast, sunrise is equally a time for activity, but of a completely different nature. If my fourth moment of joy began with a sundowner on the deck of the Baraabaru then the sixth was certainly yoga at sunrise. Only it wasn’t the activity that sealed it for me, rather the inactivity. The morning was overcast and the routine, while fulfilling, was a touch too demanding for my stiffened corpse. On the contrary, it was the feeling afterward; sat in the breakfast salon I lost any sense of time, experiencing something I haven’t felt for an age. It was a feeling of blissful relaxation. Number six, I thank you. By now, I was finding that Kuda Huraa’s lifestyle was beginning to suit me rather too much. I’d settled in, three days were up in what felt like as many hours and not a moment of ennui to be had. The disappointment of leaving was offset, however, by the knowledge of moving on to the other resort but not before what makes up perhaps the pinnacle of the Four Seasons experience: the Explorer. Carrier (0161 492 1358, www.carrier.co.uk) offers 7 nights for the price of 5 from £2625pp based on 2 people sharing a Beach Pavilion with pool on a bed and breakfast basis, including return flights from London Gatwick with Emirates and transfers. 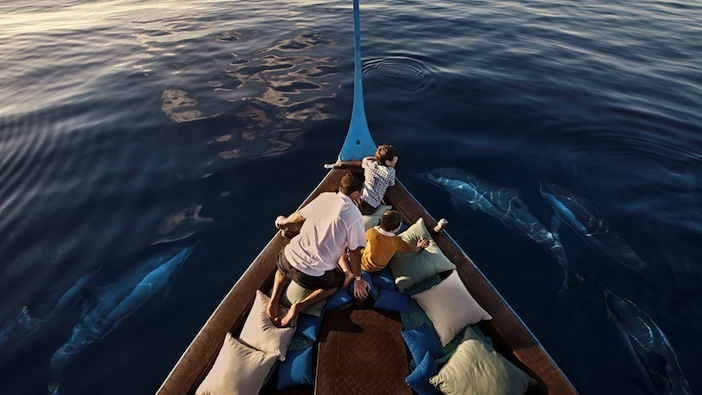 A 3-night cruise aboard the Explorer, with 3 daily dives and full board is an additional £1730pp. 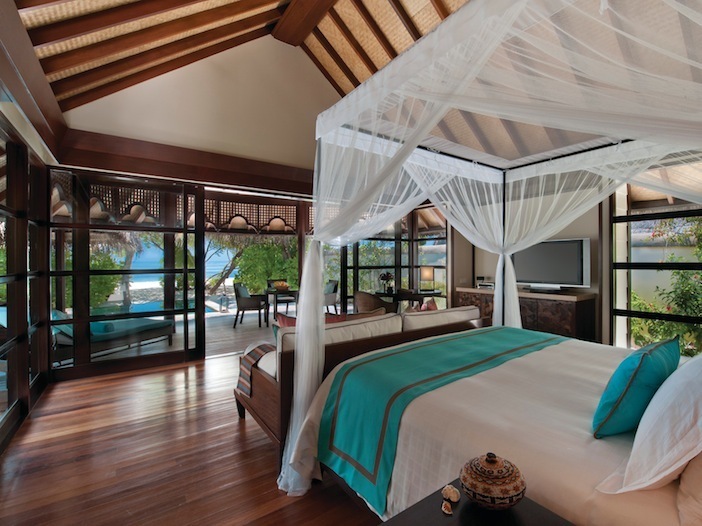 For more information on Four Seasons Kuda Huraa, its facilities, activities, surf, diving and spa packages, visit the website.